I drove around through Holbrook and onto the Jingellic Road, accessing the Tin Mine Trail from its eastern end. Even after three weeks without appreciable rainfall the trail through the pine plantation was a little muddy in places. Without mishap I arrived near my first Summit of the day, the unnamed VK2/RI-009. It’s still officially unnamed despite my having claimed naming rights after first activating it last year and dubbing it “Mount Mozzie” in honour of the local wildlife. I was pleased to see they were not in evidence on this visit, however. After a short stroll up through the bush to the Summit I set up the gear and in about 45 minutes of operating I worked VK3PF, VK2IO, VK3FPSR, VK3MRG, VK1DI, VK3UH, VK1NAM/P (S2S VK1/AC-037), VK1FAAS/P (S2S VK1/AC-037), VK1MA, VK3BYD and VK3FQSO on 7MHz SSB. I then went over to CW and worked VK3CAT/P (S2S VK3/VC-031), VK2IO, VK3AFW and VK3BQ. To finish up I went back to SSB and worked VK3EQ/P (S2S VK3/VE-001) and VK3VTH/P. Content with that I packed up, strolled back to the Hilux and drove the 6km or so to my next destination, the unnamed Summit VK2/RI-010. 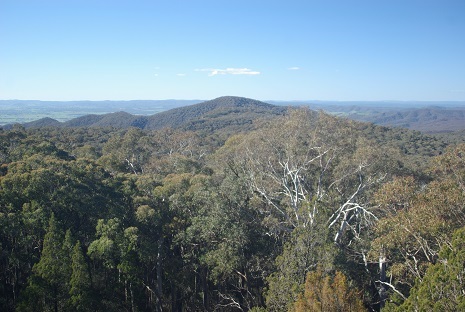 As with Mt Mozzie this one is a short, easy uphill stroll through the bush to the Summit. I set up the gear in the usual way but soon discovered that I had a problem with the antenna. It wasn’t receiving very well and the SWR was very high. I dropped it back down to the ground and fiddled with the links in case one of them had come loose. While it was down I heard a station calling me and so I called straight back, exchanging weak signal reports with Robbie, VK3EK. There was much amusement on frequency when I admitted that my antenna was lying on the ground! I pulled it back up and to my relief received signals were much better and the SWR was back to its usual 1.5 or thereabouts. In quick succession I worked VK1MA, VK3FPSR, VK3PF, VK2YW, VK3HRA, VK3ARR, VK3UH, VK1DI, VK3WE, VK2IO, VK3WAR and VK3YAR on 7MHz SSB. Time was getting on so I didn’t hang about once the initial pile-up had been cleared. I packed up and went on towards Mt Jergyle, wondering if I’d make it or whether I’d have to turn back at the bog hole. As it turned out, the NPWS have been doing some maintenance on the trail and have dumped a load of rocks where the hole used to be, so there was no problem getting through and no need to bush-bash around it. The Tin Mine Camping Area was deserted apart from a few wallabies who kept a wary eye on me as I drove past. The creek that crosses the site was running and again I was pleased to see that the NPWS had fixed up the crossing point so that it has a much more gentle entry and exit angle than previously. 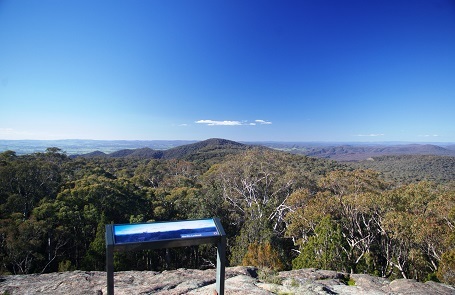 I carried on and parked at North’s Lookout, which is on Mt Jergyle VK2/RI-004 and provides a fantastic view to the west, through north to east. 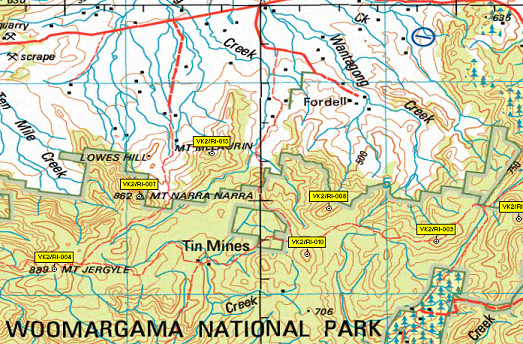 Not far away as the crow flies is Mt Narra Narra, VK2/RI-007 (called Mt Pleasant in the SOTA database). That one’s on the list for a future expedition. Wary of my dodgy antenna I set up the gear and was pleased to find everything working normally, with good signals coming in and the SWR around 1.5. In 25 minutes of operating I worked VK3PF, VK3EK, VK2IO, VK3FPSR, VK1DI, VK2KEV, VK3BHR, VK1EM, VK1NAM, VK3AV, VK1MA, VK4GSF, VK2MDZ, VK2HRX, VK3YAR, VK3APW, VK3BYD, VK3ARR, VK3ZIE/P, VK2QR, VK3YY, VK3MTB/P, VK5CZ/P (S2S VK5/SE-008), VK3ANL and VK7ALH on 7MHz SSB. The trail down from Mt Jergyle to Tunnel Road is fairly rough and can get interesting in places, so I was keen to be clear of it before sunset. With time marching on and the sun getting low in the west I decided I’d done enough SOTAing for one day, so I packed up and headed home.